A Guide to Monster Socks is a tutorial and idea generator for those who want to knit using many different colors and brands of sock weight yarns. 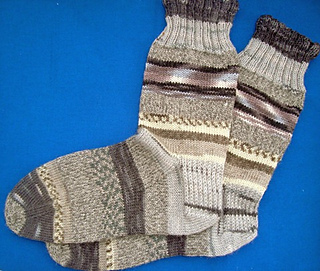 Use your favorite sock construction methods and stitch counts. Create your own One-Of-a-kind masterpiece that will warm a pair of feet and spread a little joy. Presented as a recipe of suggestions, you choose the method(s) of yarn combining (stripes, bits of fair isle, spiraling, and more) and mix up your colors to suit. This is more of a guide than a step-by-step pattern to help inspire you by giving you some mixing up techniques for your skill box.